Based on the real-life event that inspired Paula Kluth and Patrick Schwarz's bestselling "Just Give Him the Whale!," this simple but powerful story introduces educators to one of the best, most effective inclusion strategies: using students' fascinations to help them learn. Pedro, a young boy who loves whales more than anything, is heartbroken when he's told to put away his favorite toy whale on the first day of school. But then Pedro's teacher discovers the secret to helping him do his best work: not only giving him his whale, but also incorporating his special interest into the whole curriculum. Soon, Pedro's whale is helping all the children learn, as the teacher works whales into math lessons, storytime, simple science experiments, and more! Pedro's whale helps him make friends, too, as the other children start to share his special interest. An ideal teaching tool, Pedro's Whale will inspire educators to harness their students' natural motivations. The engaging, full-color illustrations (by Justin Canha, a gifted artist on the autism spectrum) also make this book perfect for storytime, so all children can increase their sensitivity to peers with special needs and learning differences. Everyone who reads Pedro's Whale will remember its eye-opening message: when you work with instead of against what students love, they feel safe, happy, and ready to learn. Used in tandem with "Just Give Him the Whale!," this enlightening story will help teachers maximize inclusion and ensure that students with and without disabilities reach their full potential. 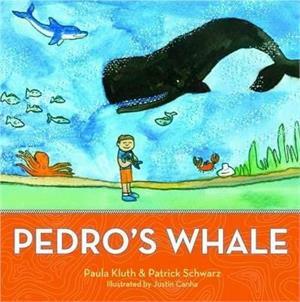 "Pedro's Whale by Paula Kluth, Ph.D. and Patrick Schwarz, Ph.D., is a picture book about autism many were waiting for. After their award winning guidebook, Just Give Him the Whale: 20 Ways to Use Fascinations, Areas of Expertise, and Strengths to Support Students with Autism, the authors realized a childrens book about areas of interests was needed. Educators, who were using the ideas in Just Give Him the Whale in their inclusive classrooms, wanted a resource to explain their strategies to their students. Parents, who had a child with autism spectrum disorder or Asperger's syndrome and who had fascinations, wanted a way for siblings and family members to understand. [...] I would suggest reading first Pedro's Whale alone with the child who also has special interests. The child with these facinations will be pleased that Pedro is like him. He can use Pedro's story as a springboard to share his feelings about his strong passion. He will value this time alone with you to ask questions or comment on things that have troubled him. While discussing the book with him, explain why you want to read it to the others in his life. Educators and parents using Pedro's Whale will appreciate the three page section How to Use This Book. One activity they suggest is to use Pedro's Whale to teach classmates or siblings about individual differences. The child in question will probably hear other students admit that they also love certain things above all else. This will lead to discussing unique needs and curricular adaptations. The childs peers will be eager to learn how to support their classmates special interest. Congratulations to Paula Kluth and Patrick Schwarz for Pedro's Whale! I highly recommend it. It has all the qualities to be a favourite in many classrooms and homes with its practical tips, high quality paper, hard cover, and the wonderful story that perfectly conveys honouring a childs area of interests." "A wonderful story that helps children and adults understand the extreme attachment to a special interest that are common in individuals on the autism spectrum"
"Enlightening . . . turns our negative views of childhood obsessions around. Just give every teacher, parent, professional, or child you know this book!" "A testament to creative parents and educators who spark the imaginations of children. Pedro shows us that by using our passions we become both teachers and learners." "When I first heard Pedro's Whale, I cried because that's how inclusion should be and how often, it is not. I'm going to buy it for my school." "Brilliant in its simplicity, Paula Kluth's enchanting book shares a powerful message for adults and children alike. We are reminded of the extraordinary opportunities we have in ordinary moments to promote a sense of belonging, comfort, and well-being." "A much-needed contemporary parable about turning a problem into a positive, illustrating practical ways in which a student's 'narrow' interest can be directed into expansive activities that benefit the entire class." "A gift for all children whose deep interests and passions are misunderstood, or even dismissed. It clearly communicates the imperative that 'to advance the mind, we must nurture and energize the spirit." "This book entertains and teaches a whale of a lesson: When any child has an unusual interest, the smart teacher who accepts and encourages that interest will open academic and social doors for that child and his classmates as well." "A wonderful story . . . so helpful and inspiring to children and adults alike. It helps us all imagine new worlds of possibility [and] provides a concrete vision for how children with autism and limited interests can have a place alongside their peers." "One simple, beautiful book . . . Endless new ideas! Paula's suggestions should be used in every elementary school classroom." "A perfect companion to Just Give Him the Whale! . . . makes the concepts readily accessible to children, and provides practical how-to ideas for educators, professionals, parents, and caregivers." Review by: Carol Tashie, Seeing the Charade: What We Need to Do and Undo to Make Friendships Happen"
"Paula Kluth has done it again! With humanity and humor, Paula uses this true-life story to remind us to honor and celebrate every student's passions."